Does this make you smile? It does me. It was just what I needed today. So often when things go wrong we just want to give up, but if we stand back and look at it as a plot twist then we can choose a new path or find a way to overcome. So if you happen to hear a rumbling in the wind today that sounds like thunder, it just may be the sound of my voice yelling "PLOT TWIST". I will adopt that phrase instead of complaining!! Plot Twist!! Hi Laura, thanks for this nice outlook at how life can play tricks on us. By the way I enjoyed really your post about lemons even if I didn't write any comments. Ah ha, that's what I will start calling those. Plot twists. Sounds better than all "heck" breaking loose; and much better than "The End" instead of just a plot twist. 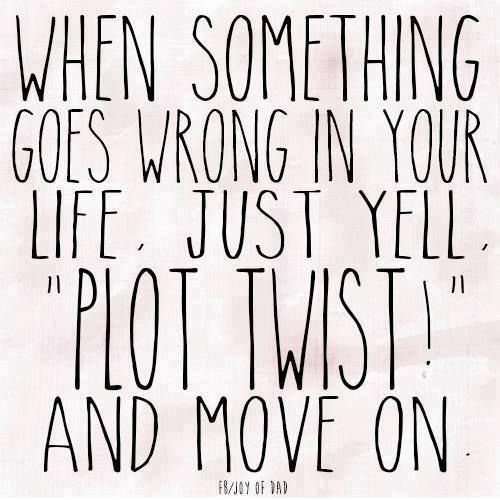 I would prefer lots of Plot Twists before we get to The End. My kids say this a lot! I like it...I may just start saying it myself! That is a good one! lol Will be using it too! I am sorry you are having another PLOT TWIST. Grrrr you just wonder sometimes. In many ways life is changing and oh boy things we did not expect. But like you most times if I can just hang on. Do a little something that pleases me like buying my favorite book or magazine. Sew a project....it all evens out as we move along.